The main strategy has been named Homer because it will give immediate profit as long as a goal is scored by the home team during the entire first half. The Homerlow variation will be printed in red. This is traded on rare occasions when the under 2.5 price is 1.60 or lower. It will also give an immediate profit if a goal is scored during the entire first half but the profit will be much more than the main Homer if a home goal is scored during the first nine minutes. This is not mandatory as you can still play the main Homer. The home team score within the first half. The away team score first after 9 minutes then the home team equalise by HT. The maximum liability on single stakes is £67.50 if u2.5 lay price is the max of 1.72. If the strategy is followed the maximum loss with be £19. However the wins far exceed the losses which make it a profitable strategy. The away team score then the home team equalise by HT. The maximum liability on single stakes is £57. The possible profit from the start on single stakes is between £18.50 & £33 but is usually £21. If the strategy is followed the maximum loss with be £19 but it usually lower. The key to any long term strategy is the match criteria. If you follow the criteria in the order shown you will find that games are few and far between but previous results have shown that patience is rewarded. Betfair daily in-play coupon – Look for a game where the Match Odds home team back price is between 1.90 and 2.65 and away team price must be no lower than 2.75 to back. Disregard first leg games such as European games or Play offs. Disregard France and Portugal leagues. Under 2.5 to lay must be 1.87 for match selection. However the actual lay put into the market is a max of 1.72. Correct score bare minimums to back are 1-0 7.2, 1-1 7.2, 2-0 11.0 but you need to examine the combinations of backing the CS using a total liability of £27. For example 1-0 might be 8.4 so you could get away with 1-1 at 7’s or 2-0 at 10’s and have a lower u2.5 price. Examine league position recent results and home form. I use Futbol24 and select the last 9 home games for the home team. I also look at the last 6 away games for the away team although it’s the home stats that are the most important. If two teams are both in the bottom three I don’t look at stats as I know they will be bad but I pick the game on the basis that when two poor teams are up against each other they usually product goals. Often liquidity doesn’t start picking up until 3 hours before a game and you may have an idea which game you are going to play but the final decision should be made an hour before KO. For CS market ask the lay price for your back price about 90 minutes before KO and reduce to the current back price with about 10 minutes before KO. The stakes you have already worked out should be based on the lower price so that any higher price is a nice bonus. I advise never to trade a game that has less than £3000 matched on both CS and U2.5 markets. It goes without saying that the objective is to make a profit but it is also to limit the loss. The loss limit is £19 and if we were to lay from the start we would have to exit around 35 minutes. However it is statistically proven that there is more chance of a first goal between 9 minutes and HT than there is between the start and 35 minutes. Also because there is always added time at the end of a half there are more minutes to score that important goal. The correct score backs are put into the market before KO. The combination of backs equal £27. The correct score price bare minimums are 1-0 7.2, 1-1 7.2, 2-0 11.0 but you need to examine the combinations using the total liability of £27. For example 1-0 might be 8.4 so you could get away with 1-1 at 7’s, 6.8’s or 2-0 at 10.5 ’s, 10’s and have a lower u2.5 price. The u2.5 price for these CS prices will be around 1.60 after 9 minutes. Please take into account that the maximum liability of the U2.5 will be £52 at 1.72 = £37.44. The reason 1-0 has the lowest green is so that we don’t waste the extra backing cost if the away team scores first. If the home team scores first you can make the choice of topping up 1-0 with £2 or holding your position in case a subsequent goal is scored. The reason 1-1 is the highest green is that it gives us extra leverage to offset a 0-1 position if it starts to go wrong. We are going to enter the lay of U2.5 on 9 minutes but if an away goal is scored before 9 minutes we are vulnerable to a £10 – £12 loss with no cover on a high score. If a home goal is scored before 9 minutes we are also vulnerable to a scratch to £5 loss with no cover on a high score. Therefore we need to cover our position backing the First Goal market 0-10 minutes for £3. 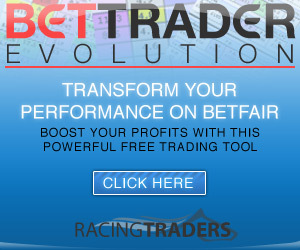 The prices will be between 5.1 and 6.0 and will give a profit of between £11.75 and £14.30. If a goal is scored before the lay enters the market we exit CS immediately having pocketed the FG so we have a net position of a reasonable profit if it was the home goal or a scratch if it was the away goal. Please note that the FG market does NOT go in play. On 9 minutes lay under 2.5 goals for £52 which will give a net total of £49.50. The minimum price we lay is 1.72 but for every 0.05 reduction in price you will gain almost £2 profit if a 1-0, 1-1 and 2-0 half time score is obtained. We can pick a game with u2.5 at 1.87 because it should reduce by 0.15 within 9 minutes. On rare occasions if the game starts off with frantic end to end chances the price could stay above 1.72 by 9 minutes. In this case you have a choice either to take the price limiting your potential profit if 1-0, 1-1 and 2-0 or to take the chance of holding on until the price reached 1.72. The lay of under 2.5 goals is always £52 and the correct score liability is always £27. Back CS scores 1-0 1-1 2-0 totalling £27. Back First Goal 0-10 minutes for £3. Lay U2.5 on 9 minutes for minimum price of 1.72 for £52. When the U2.5 is 1.60 or lower we can lay from the start (therefore don’t need the FG back) as the price normally reduces slower so we find that we can more often reach HT with our maximum acceptable loss. The lay is slightly lower as we are not spending that extra £2 on the FG back. Lay U2.5 from start for maximum price of 1.60 for £50. 0-2 Profit of about £37 on the overs as correct score will be a complete loss of £27. Nett profit about £10. 0-0 This is the only score with a potential of a max loss but all is still not lost. Back the same amount that you layed on the u2.5 which will leave a scratch if there are three goals in the second half. Also if you scalp pre match £100 for just one 0.5 tick you will have approx £50 green on the 0-0 at the start. This will give you the option to close your positions with a scratch or continue for 10-15 minutes into the second half. The scalp is a powerful addition as the only losing score at HT will be 0-1. A home goal between 9 and 20 minutes will see the 1-0 increase in price and allow you to top up the score by £2. However this would be at the cost of the U2.5 market where a guaranteed profit would be reduced to if the game ends with 3 or more goals. Another option is to do nothing and hope for another goal before HT thus saving that £2. You may decide to do nothing and hope for the second goal but the profit will be very small if the game ends 1-0 so you must top up by HT at the latest. If an away goal arrives first then don’t worry and most importantly don’t panic. A second goal, whoever scores, will change your position into profit. If it becomes 0-2 then you may be surprised to know that it is good news. You have lost all the CS liability of £27 but the U2.5 lay will be worth at least £37 if 0-2 in first half hour and you can trade out with a nice profit. If it becomes 0-2 right on HT you should be able to trade out for a small profit or take the gamble of an early goal in the second half to complete the Homer. If it remains 0-2 on 55 minutes then your overall position will be a £10 loss. There are only two scenarios where you a facing a loss. 0-0 and 0-1 at HT will result in a £12-£19 loss if fully trading out CS and leaving a scratch on overs. This is a successful long term strategy. It’s simple, it works and there is nothing like it across the Internet. The only negative is that there are not enough of them. It won’t make you a millionaire but it will be a reliable stream of profit if followed to the letter. Naturally the final picks are critical to the strats long term success. Full members of the Trading Football service can follow my picks on Facebook. Look out for Handy Andy with a picture of Homer in a Man.Utd shirt.